In Car Adapter - Optimal Safety, Superior Speed - Mini size car charger for charging your smart.. 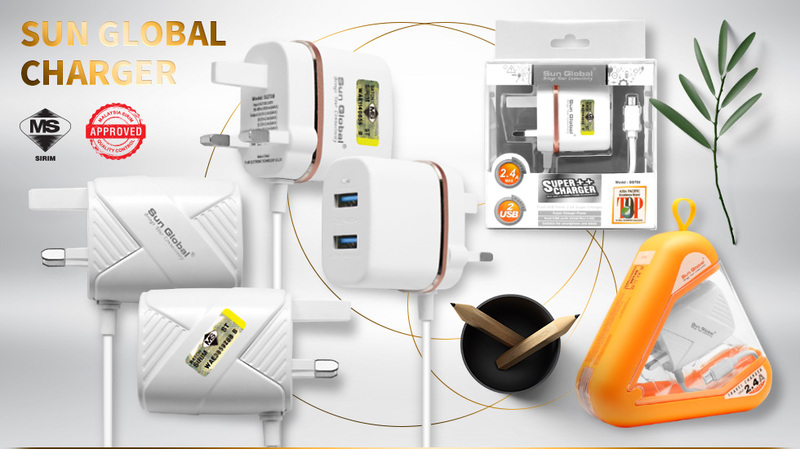 PRODUCT FEATURE - Input Port : Type-C - Transmission Power : 10W(MAX) - Input : 5V=2A ..
- Mini size home charger for charging your smartphone and tablet from a power socket. - Provides t..
Smart and fashionable - 3 Slot 3.1A output- Provides total of 3.1A high power, high effeciency, safe..
SPECIFICATIONSINPUT : DC 12-32VOUTPUT : DC5V - 3.1A , DC9V - 2.0A , DC12V - 1.5AELECTRIC LEAKAGE , O..
FEATURESSun Global USB Car Charger, high speed USB charging high efficiency safe and reliable. With ..
Smart and fashionable - Dual USB Charger 2.4A output - Mini size car charger for charging your sma..
SMART AND FASHIONABLE DUAL USB 2.4A OUTPUT CHARGER - Mini size car charger for charging your smart..
Smart and fashionable - Dual USB Charger 3.4A output - Mini size car charger for charging your sma..
Travel Adapter - Optimal Safety, Superior Speed - Mini size car charger for charging your smartpho..
© 2010 - 2016 SUN GLOBAL TECHNOLOGY SDN BHD. All rights reserved.